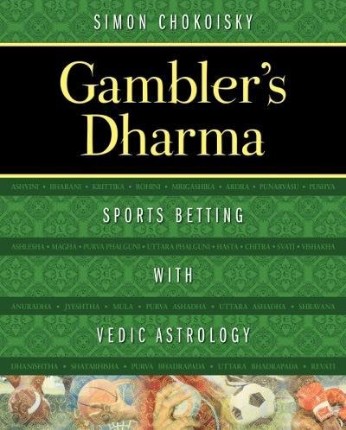 Dharma means “the right path” or “your rightful purpose.” A gambler’s dharma, narrowly defined, can mean that for a period of time—a month, a year, or even a lifetime— a person’s rightful purpose involves speculation. This is a rare and often dangerous path reserved for a few. A wider definition, however, tells us that anyone who risks something to be themselves, to share their purpose with the world, is a type of gambler. Anyone who carves out new roads, sometimes butting up against painful dead ends, sometimes clearing the way to an undiscov- ered country, gambles with their comfort, livelihood, or reputation. But a person driven by purpose will go to the ends of the earth to share it. It is astrology’s job to help people find their purpose. To do this, astrology uses a map of the sky drawn for a particular space-time event to judge its potential. A snapshot of the heavens at the moment a baby is born, a question is asked, or a match is played can reveal how that life, question, or competition will play out. Every birth conceals the fruit of its life, every question contains the seed of its answer, every battle’s outcome is known from the moment of its inception. This is the core precept of astrology as I understand it. and rectangles indicate stability and durability, humankind’s way of carving out a piece of permanence in an impermanent world, while curvilinear shapes connote movement, restlessness, and change, depicting nature herself unfettered by human touch. You can verify this yourself the next time you’re in an airplane: the square shapes you spot from high above indicate human dwelling and cultivation sites, while nature is inherently curvy. That is also why settled human civilizations tend to favor squarish plots and dwellings, while nomadic tribes prefer to live in circular enclosures like yurts and teepees, which mirror the evanescent and ever-changing flow of nature. So if you want stability and permanence, it’s hip to be square. If you want never-ending change and excitement, prefer the circle. The square’s affinity to permanency and order is perhaps why Vedic astrology appears to some as more fated and predictive, while Western astrology’s circle is more psychological. The predictive tendency of Vedic astrology is evidenced in this book, where we attempt to fix the outcome of an event before it has even begun. Click here to purchase the book and read more.